This is a great recipe that I'm sure your dogs will love. I make it all the time for mine! 1. Mix all ingredients and roll out to 1/4 inch thick. 2. Cut into shapes and bake at 350 for 20-25 minutes until crunchy. You will need to keep them in the freezer because they don't contain preservatives and won't last very long otherwise. My dogs love them straight from the freezer! Hope your dogs enjoy them. Thanks for sharing. I wanted you to know that my dog loves these cookies. I always freeze them and when it's too hot outside, I give him a frozen treat - his very own Doggie Popsicle! I sometimes ring the changes with different baby foods too and they're always a success. My dog really liked these cookies. I made some for his birthday, he's 4 years old. My Mom helped me, but only a little bit. I did most of it myself, she just put them in the oven for me. I felt happy when I was making these because I was making a special present for my very best friend. I love my dog and he loves me. My Mom says I can make these again sometime or try another recipe. Maybe one that has peanut butter in them this time. My dogs like this recipe too! 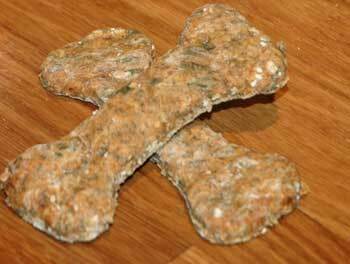 But, I'd like to point out, for the record, that I tasted one of these dog biscuits and they tasted very good. Perhaps slightly bland for us humans, but that's to be expected as they're made with baby food, which is never seasoned strongly. I think I might try some of the peanut butter dog biscuits next - I'll let you know what I think! Hi Kim - thanks for this great recipe. Not only does my Cocker love them, they're so easy to make too. I don't know what it is about these cookies, but my dog, Bella, a blue roan cocker spaniel, absolutely loves them! I do admit they smell like they would taste lovely - who knows, maybe I'll try one for myself? Thanks for the recipe - do you have any more?